Over 100 people gathered at City Hall last night (14 November) for the annual On Site Bristol Apprentice Awards. The awards have been running for over 15 years and celebrate the contribution that local construction apprentices and employers make to local industry. Achievements in trades such as plumbing, brickwork and electrical services were recognised across 18 different award categories at last night’s celebration. 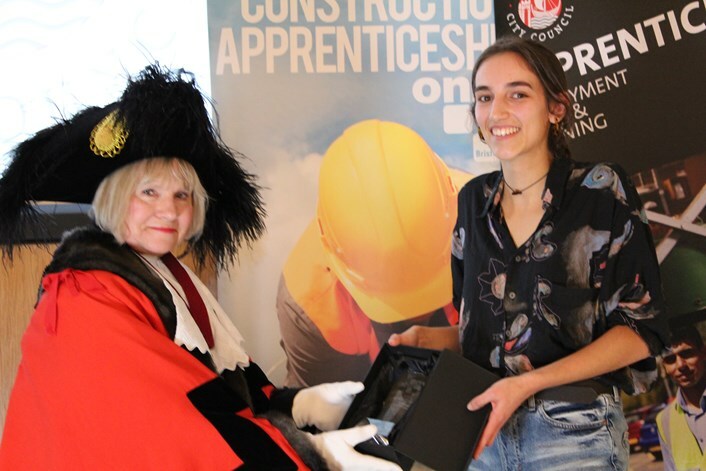 One special award was also handed out to the Apprentice of the Year, Emma Lashwood, a Joinery apprentice with Bristol City Council Housing Delivery, whose hard work and commitment to her development has been an inspiration to other apprentices. Awards were presented to recipients by the Mayor Marvin Rees, Councillor Lesley Alexander, Deputy Lord Mayor of Bristol, Councillor Anna Keen, Cabinet Member for Education and Skills and Carl Zammit, Director of 21st Century Building Services. On Site Bristol currently has 300 apprentices on their programme and has worked in partnership with over 200 employers in the area. 92% of all On Site Bristol apprentices achieve their qualifications and gain permanent employment. The programme also works closely with a range of education partners including over 40 local schools, the Construction Industry Training Board, local further education colleges and training centres. The focus is to develop the skills of the trade young people need to excel in the construction industry and to also build life skills that will support apprentices in and out of the work environment.